Maybe it was just before the adventure of your life, or maybe it was as you disappointingly agreed to do sometime, or maybe, just maybe, it was during a 50 mile run when you felt like you had no other options. You might remember, just a few weeks ago I was coming off the worst run of my life, unsure if I’d ever run again, let alone race 50 miles. But during the weeks that followed, I took a step back, embraced a little patience with myself, and decided that “Just go with it” would be the only mantra to get me through the Bull Run 50. And just go I did. A new friend, a new fuel, and 50 miles on new shoes. It wasn’t always easy. Running 50 miles never is. But embracing that mantra got me to the finish line, and here are 5 ways it did. We might be breaching into some TMI territory, so you might want to hide your kids, hide your wife (sorry, it just never gets old! ), or just skip to number 2. See, no matter how much my head loves running, my toes never seemed to find its appeal. After a marathon distance or longer, I undoubtedly get nasty blisters, lose a few toenails, and gross out anyone who sees me in sandals. It came as no surprise when I had two gnarly blisters on my big toes and ended up losing a few nails following the Mt. Mitchell Challenge. “No surprise” only becomes an issue when you end up just ignoring the situation to the point where they get infected. Because I ignored those toes, the weeks leading up to and following the disastrous 50k included 3 doctors’ visits, 2 trips to the pharmacy, and 3.5 lies to the doctor about not having any more races coming up. Instead of stopping running, I decided to buy a new pair of bulkier shoes and those crazy toe socks that are supposed to stop blisters, and try to pretend my toes weren’t actually screaming at me. Come Bull Run race day, I had only taken the new shoes out for a handful of miles, but my old shoes were just too painful on the infected toe. Just go with it, I decided, and showed up to the race with squeaky clean Salomon Sense Mantras on my feet. I knew very well that this could have meant the race was over before it began, but turns out it was just what the doctor ordered. A few days before the race, Katie found out she had a few obligations that would keep her from coming out to cheer me on. Bummer. I didn’t think I was mentally prepared to be out there all day alone. Just go with it, I kept telling myself as I lay in bed wide awake the night before the race. You’ll be fine. When I made my way in to the regional park’s bathroom for a pre-race pit stop (yeah, you know what I’m talking about), I unexpectedly saw a guy I know form Back on My Feet waiting in line. We were both excited to see each other, but it wasn’t until we were back out near the start, fixing up our drop bags, that we really started to chat. Turns out he was alone that day as well, so we decided to tackle the first few miles together until one of us wanted to pull ahead. Just go with it, I thought to myself as we toed the line side-by-side. The first few miles turn into 40, and the 8 or so hours we spent together ended up being a huge help for both of us during the inevitable ultramarathon lows. I’m one to keep it simple when it comes to race nutrition. Gu, water, and chips. Maybe some dates. Maybe not. At the second aid station I saw my running buddy pop a few pills they had laying out at the aid station. Fearful that I was missing out on some sort of performance enhancing drug, I went over to check out what they were. Salt tablets, something I hear people mention all the time, but I’ve never actually used. Over the next 7 miles between aid stations I asked him all about the tablets, how often to use them, how many to take. By the time we rolled into aid station #3, I was essentially a salt tablet expert and ordered a few for myself. Just go with it, flowed through my mind as I popped them in my dry mouth. Aside from a short stomach issue around mile 33, my stomach felt great all day, and I credit that mostly to those salty capsules. 4) Fun runs. Turns out they are pretty fun! I just wanted to finish this race. 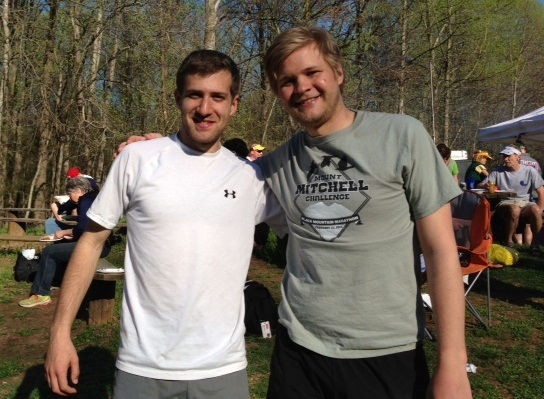 My head was so out of it after the 50k that the only goal I had for Bull Run was to have fun and finish. PRs are always nice, but having fun would have been nicer. Turns out, when you have no expectations, a new friend, and beautiful trail, a 50 mile race can be lots of fun! We took our time at the aid stations, chatting with the volunteers. I soaked in the thousands of blossoming Bluebells that lined the miles of trail. When one of us started to feel like dirt and found ourselves no longer having fun, we took some breathes, slowed down, and chatted it out until the spirits were lifted. The just go with it approach to the entire race allowed me to take everything in stride, drop any apprehensions that come with a race day, and focus on having fun. I was 47 miles into the race. My running friend and I had split ways at mile 40, and I was deep in my head and on the hunt for the finish. Feeling awful, I decided to walk a perfectly flat, totally runnable field. A runner came up behind me, “You alright?” he said. “Yeah, just need a break.” I was disappointed the jolt I usually get this close to the finish wasn’t coming. “Better get moving! We’re right on pace to break 10 hours!” He took off in front of me. I looked at my watch for the first time in over an hour. 28 minutes to go before the 10 hour mark. It felt like such a short amount of time. Just go with it I muttered in a soft, frail voice, and took off running. In reality I was moving at a snail’s pace, but the effort I put out those last 3 miles felt like I was gunning for a 5k PR. I hit a rocky section. Just go with it. I kept running. I hit a steep hill. Just go with it. I kept running. I crossed the line at 9:58. Just under 10 hours. I know better than to run an ultra in new shoes. I know better than to try new fueling techniques on race day. And I sure as hell know better than to fib to a doctor. But sometimes we can’t live life according to a training schedule or Garmin pace. Sometimes we just have to go with it. It might not always work out, but when it does, it just might feel great. Very inspiring post, thanks for sharing Doug! I have a race coming up that I’m also sort of dreading, but now I am armed with my new mantra: Just go with it! Thanks Megan! Good luck on your race, and like you said, just go with it. Let me know how it goes!